A team of people were at the Center to receive the cubs at 10:00 p.m.; Dr. Ingrid, one of the Center’s veterinary interns, and her vet students admitted and examined the cubs, while wildlife rehabilitators Kelsey and Shannon returned to work to set up a crate and prepare bottles of electrolyte formula. Both cubs were thin, dehydrated, and mildly anemic. Black bear cub #18-0349, a male, was left untagged (therefore becoming this year’s “No Tag”) and weighed in at 1.93 kg. The other cub, a female, weighed in at 2.06 kg and was tagged with a pink ear tag in her right ear. Radiographs of Pink Tag showed what could be a small chip fracture on the back of the bear’s skull. While likely painful, the small fracture shouldn’t cause future health issues for the bear. Dr. Ingrid gave the cub a dose of an anti-inflammatory medication. When the veterinary team finished the examinations and ear tagging of the cubs at about midnight, Kelsey and Shannon bottle-fed the cubs with electrolytes. No Tag ate a little better than Pink Tag. The cubs will eat three times a day in the coming weeks; rehab intern Shannon reports that the cubs are not interested in bottle-feedings, though, during the past day, they have been most interested in their “mush bowls” – soft dog food with thickened formula designed for Black Bear cubs. The cubs are living together in their own zinger crate in the same room as the first two bears cubs of the season, admitted earlier on April 13. The cubs will soon be introduced to each other during feedings and supervised play time. Now is the time of year when sows and cubs are emerging from their dens – the Wildlife Center urges drivers to be alert and slow down when driving in areas where bears may be living. If you find a cub by itself and suspect it may be orphaned, please call the Wildlife Center or the Virginia Department of Game & Inland Fisheries for advice. The Wildlife Center admits dozens of bears each year, and while fully equipped to rear cubs and bears, it’s best to give the bear cubs every chance possible to be reunited with their mothers. Never take a bear cub home to keep, even for a short period of time. Bear cubs may be cute and cuddly, but close contact with humans can ruin a bear’s chance of being released back into the wild. 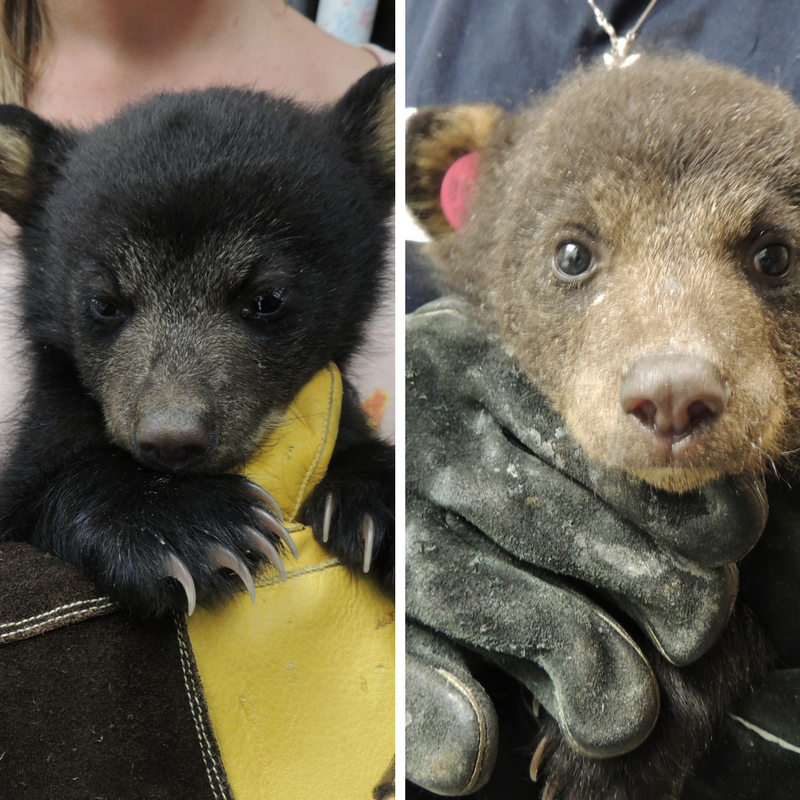 Your donation will help provide these two orphaned bear cubs with special care -- for a year! Thanks for your support.